In Italy they’ve starting jailing scientists who make mistakes. Six Italian scientists got six-year sentences last week for misreading danger signals before Italy’s devastating L’Aquila earthquake in 2009. Be assured that such a turn of events is unlikely here in Australia. We’re much more civilised. Our approach to scientists is a two-stage process: one, ignore them; two, deprive them of funding. There’s another difference — in Australia we don’t require them to have made mistakes. When we take away their funds we don’t even bother to check what they’ve been doing, how successful they’ve been, and how they might help us in increasingly uncertain times. The Gillard government would deny this, but it’s determined that scientific research is less important than being able to say that it’s achieved a budget surplus. Tasmania stands to be a big loser out of this, a fact that doesn’t yet seem to have registered with the Tasmanian government. For the record, I’m not a scientist myself and earn no money from science, but I’ve spent many years observing what scientists do and say. From this I conclude they’re as flawed as the rest of us. They can be petty and prejudiced, and a few of them may not earn the money they’re paid. But one thing stands out in their favour. In helping guide our thinking about us and our universe, scientists on the public payroll put an exceptionally high price on integrity and ethical behaviour. They do it because their careers depend on it. Science’s inbuilt process of endless questioning virtually guarantees that dishonesty will eventually be found out and the transgressor’s reputation trashed. This is one profession we can reasonably put our trust in. Last week I attended an international science workshop in Hobart, “Seeing below the ice”. It was looking at ways of getting under Antarctic sea ice and ice shelves, where so much is currently happening that’s crucially important to future southern hemisphere weather and the state of the global ocean, including sea levels. The gathering aired a welter of practical ideas to advance our understanding of the sea ice and Antarctic coastal zone before finalising strategies to gather remote field data. It was human ingenuity at its best. There were numerous papers on mapping the cavities beneath ice shelves using remotely operated vehicles and on use of deep-diving seals carrying instruments to gather under-ice data. Using sound waves to investigate the vast watery domain under the Ross Ice Shelf was the subject of a paper given by oceanography’s 95-year-old elder statesman, Prof Walter Munk of Scripps Institution, California. The meeting had a real air of urgency. Like their colleagues everywhere, the scientists involved were well aware that time is our enemy if we’re to stop global warming. Yet people and their leaders continue to ignore unpalatable danger signs to focus instead on things that appeal to the electorate. Witness last week’s Mid-Year Economic and Fiscal Outlook (MYEFO), which cut a swathe through university research funding, including a $20 million cut over four years for the University of Tasmania. It’s just a temporary slow-down, says Canberra, to ensure that funding remains sustainable long-term. Sustainable? The word carries a heavy dose of irony when you consider that some of the programs hardest hit by this and earlier budget measures aim expressly to identify threats to sustainability — not of government funding plans, but of the planet. The irony gets heavier. Climate research is a big loser from the MYEFO, but medical research came out a winner. The future well-being of the whole world and all its millions of species (including us) is forced into a poor second place behind the health of a single species, our own homo sapiens. Unless a political fix can be sorted out soon, the university losses on top of earlier cuts to programs administered by CSIRO and the Australian Antarctic Division will be the last nail in the coffin of the Hobart-based Antarctic Climate and Ecosystems Cooperative Research Centre (ACE-CRC). The ripples from such a loss will be felt throughout the climate science fraternity in Tasmania, a focal point for study of Antarctica and the Southern Ocean, but they’ll go well beyond that. 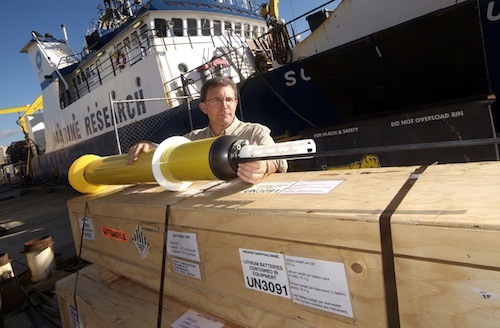 Tasmania is now a major player in the global climate research scene. The ACE-CRC is a shining example of how Australia’s 20-year-old system of cooperative research centres can work for the benefit of all. A brainchild of the Hawke-Keating years, CRCs were supported for 12 years by the Howard government because they delivered bang for the buck. Operating on five or seven-year funding cycles, CRCs provide a flexibility with programs, staffing and resourcing that established institutions like universities cannot match. The ACE-CRC serves as a crucible for developing research ideas and nurturing up-and-coming postgraduate students. In this crucible, funding and in-kind resources are brought together from multiple sources and matched with research strategies for maximum return. An independent report has found that the ACE-CRC yields a return to the taxpayer of over $3 for every dollar spent. The federal government’s contribution is a mere $5 million. Our future here and globally depends on us knowing what’s happening in the Antarctic. The potential loss of the ACE-CRC is a disaster in the making — not just for Tasmania but for the nation and the world. Lara Giddings, put this on your to-do list. Encourage Will Hodgman and some of his federal colleagues to join a bipartisan mission to Canberra to save this icon of Australian climate research. This entry was posted in Antarctic, atmospheric science, Australian politics, biological resources, changes to climate, climate politics, climate system, CSIRO, glaciology, ice, marine organisms, marine sciences, oceanography, organisations and events, science, sea level, Southern Ocean, Tasmanian politics and tagged ACE-CRC, Antarctic, atmospheric science, Australian politics, biological resources, changes to climate, climate politics, climate system, CSIRO, Dr Steve Rintoul, glaciology, ice, Julia Gillard, L'Aquila, Lara Giddings, marine organisms, marine sciences, oceanography, Scripps Institution of Oceanography, sea level, Southern Ocean, Tasmanian politics, University of Tasmania, UTas, Walter Munk, Will Hodgman. Bookmark the permalink.